It was in the summer of 1969 when the federal government presented its “White Paper” to parliament. The policy proposed to dissolve the Department of Indian Affairs and Northern Development and shift the responsibility to the provinces and two territories —in effect, wiping out the government’s constitutional duty to Canada’s First Nations; the paper was an insult. On October 3, 1969 sixteen chiefs came together to form the Indian Brotherhood of the Northwest Territories. Its first president was Morris Lafferty of Fort Simpson with Mona Jacobs of Fort Smith, NT succeeding him. Her role as interim president of the organization was to work under the mandate of protecting the rights and interests of the Dene under treaty. When the Indian Brotherhood was formed, the most pressing issue was the building of a proposed pipeline through the Mackenzie Valley to carry natural gas to southern Canadian and U.S. markets. The Dene agreed, at the time, to delay any decision by the federal government on the project by demanding that Dene rights be recognized through a negotiated settlement of land claims. The Dene questioned who had the right to make decisions concerning industrial development of the resources on Dene land, particularly when it comes to having major impact of land and environment. In 1970, after serving four months as president, Ms. Jacobs was replaced by Roy Daniels of Behchoko. In 1971, James Wah-shee also of Behchoko became the third president. 1972, without consultation with the band councils, the federal government planned a complete removal of DIAND from the north. As part of the plan, the federal department was negotiating with the Government of the Northwest Territories (GNWT) for the transfer of program responsibility for the treaty Indians. By 1973, the Chiefs in Denendeh made a major breakthrough when DIAND established an office in Yellowknife, it meant recognition of band councils and treaty rights. The IB-NWT staff, fieldworkers and researchers had a strong dedication for their work. They learned on-the-job to meet the needs of the communities. Individuals from communities were trained by the organization and they went on to train others in community development, land claims research and communications initiatives – demonstrating that the Dene could do the work for their own people. The Indian Brotherhood of the Northwest Territories and the Metis Association of the NWT worked together to develop a single land claim on behalf of all the Dene and Metis in the Mackenzie Valley. On July 19, 1975 in Fort Simpson, NT more than 300 delegates from all Denendeh communities gathered to approve a statement called “The Dene Declaration”. The delegates at this Second General Assembly represented the Indian Brotherhood of the Northwest Territories and the Metis Association of the Northwest Territories. An agreement on the name of the organization “Indian Brotherhood of the Northwest Territories” was formally changed during the 8th Dene National Assembly held in Fort Norman, NT, August 14-20, 1978, to the “Dene Nation”. In July 1976, the Dene made public the Dene Declaration and Manifesto, calling for the recognition of a separate nation of Dene within the Mackenzie Valley. The Dene claim called for the establishment of a separate Dene-contolled government for all Dene. Later in 1976, the Metis Association stated that it could not support this goal on philosophical grounds and announced it wished to develop its own claim. The federal government provided funding to enable the Metis to do so because it was considered essential that their aspirations be know before negotiations began. This was done on the understanding that there would still be only one final settlement for native claims in the Mackenzie Valley. The Royal Proclamation was issued by the King of England. This forbade the encroachment of white settlers on Indian lands; recognized the existence of aboriginal rights. Smallpox epidemic decimated the Chipewyan population. Indians are defined for the first time in colonial legislation. Epidemic of an undiscovered nature killed 400 people at Fort Rae. Over 1000 Dene died of “Influenza” in the area from Fort Simpson to Peel River. 94 of a population of 600 south of the Great Slave Lake died of “Influenza”. Canadian Confederation. The British North America Act (Canada’s Constitution as issued by Britain) assigned legislative jurisdiction over “Indian and lands reserved for Indians” to the federal government of Canada. The Fathers of Confederation. Signing of the British North America Act was on July 1, 1867. The Enfranchisement Act was passed to lure First Nations citizens into giving up their special status and to give them Canadian-style property rights, thus encouraging their integration into the New Canada. Rupert’s Land is transferred to Canada by order of the Queen. The Hudson’s Bay Company transferred its monopoly rights to this land for 30,000 pounds. By this date, nine trading posts have been established in the Mackenzie District. Indians are registered, in anticipation of the Indian Act. The Northwest Territories Act is established. The first Indian Act was passed whereby its provisions generate an administrative separations of First Nation peoples. The British government hands over all the Arctic Islands to the Canadian government. The first Act for the preservation of game in the Northwest Territories is put into force. Gold is discovered on the upper Yukon River. Mineral claims staked at Pine Point NWT. Treaty Eight is entered into by some representation of the Dene Nation south of Great Slave Lake and the Crown in Right of Canada. Dene arriving on the southeast shore of Fort Resolution in birchbark canoes (circa 1900). An adhesion to Treaty Eight is entered into by representative the Dene Nation North and South of Great Slave Lake. Steel traps began to replace the dead fall trap. 137 non-Dene lived in the Mackenzie District. Measles epidemic killed 60 people in Fort Rae, 66 in Fort Resolution. Alberta and Saskatchewan are created as provinces out of the old Northwest Territories. The NWT is divided into four districts: Ungava, Franklin, Keewatin, and Mackenzie. 519 non-Dene living in the Mackenzie District. In 10 years the non-Dene populations quadrupled. 60th Parallel was defined as the southern boundary of the NWT. Red-Brown crude oil was brought to Edmonton from Norman Wells. Dr. Bosworth staked three oil leases at Norman Wells. “The Unexploited West”, government promotional publication was released. 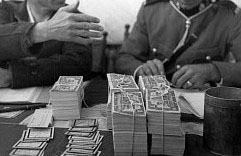 Cash replaced “Made Beaver” as medium of exchange. Dene at trading post with fur trader inspecting the fur of fox. Migratory Birds Convention Act: This Act is an “Inter-State” agreement between the United States and Canada. The agreement ignores aboriginal hunting rights as guaranteed by treaty #8; is never referred to in 1921 by Commissioner Conroy in his address to the Dene concerning treaty #11. The Migratory Birds Convention Act becomes law. The NWT Game Act is introduced. Imperial Oil acquired leases from Dr. Bosworth and drilled for oil at Normal Wells. The Dene under treaty #8 refused to accept treaty payment to demonstrate opposition to the Game Regulations imposed on them in violation of Aboriginal and Treaty rights. R.M. Kitto was commissioned by the Dept. of the Interior to investigate the natural resources and economic development of the Mackenzie district. 15 Dene starved to death at Fond du Lac, SK. Oil was officially discovered at Norman Wells, NT. Treaty #11 is entered into by the Crown in Right of Canada with the Dene north of Great Slave Lake. (There is evidence that some of the signatures on the treaty may have been forgeries). Sixteen Man Territorial administration established at Fort Smith NWT. Six councillors were appointed to the NWT Council for the first time. One hundred and forty non-Dene trappers are licensed in the NWT. The Indian Act is changed to include the administration of the Inuit. Intoxicants imported into the NWT totalled 272 and-a-half gallons. RCMP report from Fort Rae referred to the Dene and Inuit as two nations. It wasn’t until the 1940’s that the federal government decided to refer to the Aboriginal Nations as tribes and bands. The production of raw fur in the NWT reached nearly $3,000,000, the highest ever until then. The Influenza Epidemic infected approximately 10 to 15% of each village population, as it swept through the Mackenzie District killing about 600 Dene. Beaver trapping was closed for a total of five consecutive years. A total of 551 non-Dene were licensed to trap and hunt in the Mackenzie district. Uranium was discovered on Great Bear Lake. Gold is discovered in Yellowknife. Only Dene people reside in the Yellowknife area. Port Radium Mine activities decrease. Indian Affairs became a branch of the Department of Mines and Resources. The Fort Resolution Dene boycott Treaty Eight again because of government encroachment of Dene Rights and lands. Chiefs of Taltson River, Little Buffalo River, Lutsel K’e, Hay River and Yellowknife supported the Fort Resolution stand. The Dene at Dettah refused treaty payment in protest of Treaty and Aboriginal Rights being infringed on by Game Laws. The Dene demanded a meeting with the Governor General of Canada. 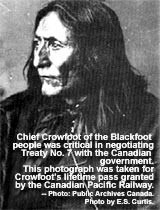 Indian Agent Dr. Amyot requested RCMP Inspector Schmidt of Calgary to settle dispute over this treaty. Most non-Dene trappers have become prospectors and miners. Indian Agent’s report: “Among the more vital questions were the following: ‘Section 31 of the NWT Game Ordinance’ – The year before last, the Chiefs claim, the Indians were not subject to restrictions (under the ordinance)…They claim that when they are hungry and have nothing to eat they can not wait for an animal named under “F”… to come along. RCMP Sergeant sent in to meet with Chiefs over Treaty Boycott. Main Airport in Fort Simpson built by the United States Army. Fort Resolution and Hay River Dene protest the imposed Game Laws and restrictions on their lands. Chief Susie Abel traveled from Yellowknife to Fort Rae to meet with the Chief and Council over Treaty #11. Yellowknife’s second boom for Giant Mine begins. Fort Rae Dene protested the Game Law and restrictions. Giant Mines started new hydro dam on Snare River 90 miles west of Yellowknife. Vestige remains of the former Giant Mine sits on a gravel pad near Yellowknife. All Dene Bands in the NWT lodge complaints against the Game Law. Government took over construction of the Snare River Hydro Dam. Laws over game transferred to Territorial Administration. Chief Lamalice of Hay River protested, to the Governor General of Canada, the game laws and restrictions imposed on hunting. The Fort Rae Dene Band refuses to obey the Game Ordinance. Sub-Chief Louis Norwegian of Jean Marie River protested restrictions placed by the government on his people’s right to obtain meat. Oil and Gas Exploration begins in Fort Simpson region. The Dene Chiefs meeting in Fort Smith, resolve that any Treaty Indian be allowed to hunt all year long for any game necessary for his livelihood. James Gladstone or Akay-Na-Muka’s the first Aboriginal person to be appointed to the Senate. to be appointed to the Canadian Senate. The “Nelson Commission” is appointed to investigate the unfulfilled provisions of Treaties #8 and #11 as they apply to the Dene of the Mackenzie Valley. Treaty Indians are allowed to vote and to consume alcohol in Canada. Status Indians become Canadian citizens (the franchise). Canadian Bill of Rights forbids any kind of discrimination. Federal Universal Indian Suffrage granted to Indians (voting). Michael Sikyea of Yellowknife is arrested by the RCMP for shooting a duck “out of season”. The Supreme Court finds that the government of Canada has breached Treaty #11, but to its regret, upholds the government’s authority to do so. Section 35(1) of the Constitution Act 1982 prevents the government from doing this in future and may render invalid the part of the Act under which Mr. Sikyea was convicted. Dene moved from old Fort Wrigley to Wrigley at the instigation of the government. Eighty dog teams (each pulled by an average of seven dogs), arrived in Fort Franklin from Fort Rae, Rae Lakes, Snare Lakes and Lac La Martre, with approximately 200 Dene to discuss Treaty 11; to plan what to do to protect the land for the future generation. Minimum average distance each traveled was 600 miles. Businessmen and non-Dene transients win their struggle for a liquor store in Fort Simpson. Rae Band temporarily refused Treaty payment over land issue and Treaty. Ed Bird of the Thebacha Association of Fort Smith presented a brief regarding compensation to the Dene for loss of land and for the role of the Dene in future, to a meeting on the revision of the Indian Act in Yellowknife. The Status and Treaty Aboriginal groups formed the National Indian Brotherhood (NIB), while the Non-Status and Metis groups (the Metis also eventually formed the Metis Council) remained united and formed the Native Council of Canada (NCC), which now is known as the Congress of Aboriginal People. Territorial Administration begins pushing Local Government. Construction of the Townsite of Edzo began, as conceived by government bureaucrats. The government of Canada presents the “White Paper”, which proposes to change the relationship between the government and Indian people, essentially, a design to transfer responsibility for Indian Affairs to provincial government by creating municipalities, etc. This would abolish the constitutional responsibilities of the government to the Indians, and is contrary to British Common Law. The Indian Brotherhood of the NWT was incorporated to protect the rights and interests of the Dene. Chief Ed Bird of Fort Smith, Vice-President of the Indian Brotherhood (now Dene Nation), was shot and severely wounded by a constable of the RCMP. He later died in hospital in Edmonton from gunshot wounds. Government presence first established in Rae Lakes. Chiefs of the Dene, in Council at Fort Rae, charged the federal government with betraying its Treaties and unconstitutionally, illegally and immorally transferring the responsibilities of Treaty obligations to the Territorial Administration. Chief Jimmy Bruneau School in Edzo was opened under the control of the Dene through their own school board. The Metis and Non-Status Native Association of the NWT is incorporated. (The name is later changed to Metis Association of the NWT and then to Metis Nation, NWT). The Dept. of Indian Affairs announced its intention to bring about a settlement of Treaties #8 and #11 which apply to Indian lands in Northern Canada. “Indians” in question, the Dene, were offered the opportunity to select their own reserves. A caveat (a declaration of prior interest in the land) to 450,000 square miles of traditional land is filed in the Supreme Court of the NWT by the Dene, illustrating their Aboriginal title. The federal government agrees to negotiate Aboriginal Rights and provides funds for research. The Indian Brotherhood and the Metis Association of the NWT announce that they will seek a single Aboriginal Rights settlement on behalf of all descend-ants of the Dene. Meeting between the Minister of Indian Affairs, Jean Chretien, and the Executive of the Indian Brotherhood of the NWT, to bring to bear the reality that the Indian Brotherhood represents the Chiefs and Band Councils on a Territorial level. Prior to this meeting, Indian Affairs treated the Brotherhood as a society of interest and refused to allocate funds for legitimate programs. The position of the government of Canada on Aboriginal Rights must change to come into line with the decision of six of the seven justices affirming Aboriginal Rights in the Nishga Land Case. Mr. Justice Thomas Berger opens the Mackenzie Valley Pipeline Inquiry to examine the terms and conditions concerning construction of a pipeline in the Mackenzie Valley. The Dene Declaration is unanimously passed by a Joint General Assembly in Fort Simpson. Dene drummers from Fort Rae traveled down the Mackenzie River, which is called Deh Cho in the Dene language, in three canoes, to all the Dene communities, holding drum dances and visiting in the homes. Project North, a coalition of the five major Christian churches in Canada, is formed to support the struggle of Northern Canadian Native people. “As Long As This Land Shall Last”, by Rene Fumoleau, is published; “This Land Is Not For Sale” is published by Hugh and Karmel McCullum. James Wah-Shee, President of the Indian Brotherhood of the NWT, addressed the General Synod of the Anglican Church of Canada in Quebec City. The Synod passed a resolution in support of the Indian Brotherhood. The Caveat decision of Justice Morrow was appealed by the Federal Government. The Supreme Court of Alberta, the court of appeal for cases heard by the Supreme Court of the NWT, reversed the decision of Mr. Justice Morrow, which ruled in favor of the Dene claim to the land. Hospital closed at Fort Rae and a cottage hospital opened at Edzo against the wishes of the people. Freeze on the development of Rae was lifted. Government had tried without success to have the people moved from Rae to Edzo. The Dene launched a quiet campaign to enlist the petroleum industry to help convince Ottawa of the need to begin negotiating a settlement with the Dene immediately. Thirty-five delegates of the Dene Nation presented The Agreement in Principle Between The Dene Nation and Her Majesty the Queen in Right of Canada to Warren Allmand, then Minister of Indian Affairs, in Ottawa. Cabinet authorizes Dome Petroleum to begin open water drilling on the Beaufort Sea. Sixty-eight permits, covering 12 million acres, are granted. The Indian Brotherhood at its General Assembly in Fort Simpson, passes a resolution to admit Non-Status Dene into membership. A confidential letter from Commissioner Hodgson of the NWT stated that government employees have no business helping Northern Natives deal with the problem of the proposed Mackenzie Valley pipeline, or any other resource development. A Counter-Conference on Northern Development was held in Edmonton, to protest the proposed Mackenzie Valley Pipeline. One thousand people participated in this alternative conference to the government-and-industry-sponsored Northern Development conference. Dene Nation representatives and the Dene from Fort Resolution met with the Minister of Indian and Northern Affairs, Warren Allmand, and officials of Shell Oil over Shell Oil’s application for a land use permit to conduct exploration for minerals in the Little Buffalo River area. The Little Buffalo River area is approximately twenty miles from Fort Resolution and provides one of the main areas for meat to the Dene of that community. Dene Nation President Georges Erasmus made it clear that violence would be considered, if necessary, to stop Shell Oil. Dene women from Fort Resolution promised to set up their tents around any caterpillars Shell Oil might move into their area. Shell Oil didn’t enter the area. The Dene demanded that Shell Oil not destroy the country there with cut lines and exploration activities. Dene demands were respected by the government for the 1976/1977 winter season. The Supreme Court of Canada ruled on the appeal by the Dene Chiefs in their application to file Caveat on the Dene traditional territory. The ruling was based on the Land Titles Act (a federal government statute, the federal government also being the defendant in the Case) which states that a caveat cannot be filed on “public land for which no title has been issued.” The Supreme Court rejected the Dene Nation’s appeal to restore the original judgement of Mr. Justice William Morrow, which ruled in favor of the Dene Chiefs, but restricted filing of the Caveat until after all appeals to the case were decided. The Supreme Court failed to relate its judgments in this case to aboriginal rights, or to recognize the inter-national history between the Dene and Canada. The NWT Council asked NWT Commissioner Hodgson to resign from the Board of Directors of Panarctic Oils Ltd. The appointment of Justice Thomas Berger to head the inquiry into the proposed Mackenzie Valley pipeline. In a successful attempt to take over control of the financial and daily administration of their sawmill, away from the Territorial Administration, and to set up meaningful community control, the Dene of Fort Resolution cut water sewer and fuel services to the houses of Territorial civil servants in Fort Resolution. Within a few days, the Commissioner of the NWT gave in and the Fort Resolution Dene won their case. NWT Indian Brotherhood opened a Southern Support office in Ottawa. Georges Erasmus, Dene Nation President, made a presentation to the Environmental Committee to the President of the United States of America, which was holding hearings on the Canadian pipeline route through the Yukon. The presentation stated that Aboriginal rights have to be recognized and a minimum of ten years to implement an agreement is needed before major development begins. The Supreme Court of Canada denies the Dene the right to file a “caveat” over Dene land but does not challenge the existence of their Aboriginal Rights as defined by Mr. Justice Morrow in 1973. The Berger Report on the Mackenzie Valley Pipeline Inquiry is published. It recommends postponing the pipeline for 10 years. The National Energy Board rejects the Mackenzie Valley pipeline route and recommends building the Alaska Highway natural gas pipeline through the Yukon and B.C. It is approved by the Canadian government in August. Dogrib Dene in Rae, Lac La Martre and Rae Lakes refuse treaty annuity unless the government recognizes that the Dene did not “cede and surrender” their land through Treaty #11. Large rally picketed the Esso building in Montreal to protest the Mackenzie Valley Pipeline. Picketers walked in silence at the request of the Dene. Georges Erasmus, President of the Dene Nation, stated the Dene Nation’s position the National Energy Board in Ottawa in a nine hour sitting before the Board. Office of the Indian Brotherhood of the NWT in Yellowknife was broken into and confidential documents were stolen. Herb A. Norwegian and Robert (Bob) Overvold began a six week tour of Germany and Denmark on speaking engagements to raise support for the Dene Nation. This tour resulted in an agreement to support from, and coalition with, anti-nuclear groups. Dene Nation research staff’s work and political pressure from the Dene resulted in blocking the Department of National Defense’s bid to use 2,4,5-t defoliant on the channel maker sites on the Mackenzie River. The use was blocked for one year till the government could evaluate the potential harm this chemical will have on the environment. 2,4,5-t is the defoliant the American Armed Forces used in their war against Vietnam. It’s use is banned in the U.S.A. Some estimates, based on scientific tests, estimate plant growth, in areas where 2,4,5-t is used, to be retarded for up to 25 years. A federal government land claims proposal, entitled “Dene and Metis Claims in the Mackenzie Valley”, is rejected by both the Dene and Metis. Federal funding for negotiations is suspended for both groups until a single claim is produced. Dene Leadership meeting in Lac La Martre to strategies on approaches to unity among all the descendants of the Dene, specifically to bring the members of the Metis Association and the Dene Nation together under one organization. 450 Dene attended. Over 300 attended at their expense, having to charter planes or travel by boat to arrive. The name “National Indian Brotherhood of the NWT” is formally changed to “Dene Nation” at the Dene National Assembly and the constitution is amended to open full membership “to all those who have formally declared themselves under the Dene registry”. Contrary to the Indian Act, the Aklavik Dene Band opens full membership to all descendants of the Dene. The Dene successfully oppose a Canadian Coast Guard plan to use defoliants along the Deh Cho River. The Dene at Rae, Rae Lakes, Lac La Martre, Fort Good Hope, Colville Lake and Fort Franklin refuse the annual Treaty annuity offered by the Department of Indian Affairs in protest of the clause which claims their people ceded the land to the Crown. The last meeting between the negotiators for the Dene Nation and the Office of Native Claims (ONC).The paternalistic and ambiguous attitudes of the ONC representatives made it clear to the Dene that there was no point in continuing so-called negotiations with bureaucrats. Workshop in Victoria organized by Project North to study Aboriginal rights as defined by the Dene, Yukon Natives and Inuit. Speaking engagements to raise support for the rights of the Dene were held in Kelowna, Vancouver, Victoria, Kamloops; with radio television and newspapers interviews throughout. The Trudeau government announced that the Constitution would be returned to Canada and that a made-in-Canada Constitution would be developed, including a Charter of Rights and Freedoms. (In 1982 provisions on Aboriginal rights were proclaimed, and were developed without the involvement of the First Nations). The Metis Association announces that the Dene Nation will be respon-sible for negotiating Aboriginal Rights for both the Dene and the Metis. The film “Dene Nation” produced by the Dene and directed by Rene Fumoleau is released. “We Remember”, by Raymond Yakeleya, the first film directed by a Dene is released. It wins the “Best Documentary” award at the American Indian Film Festival in 1980. James Ross publishes “Dinjii Zhun Dene Games”, a booklet introducing seven traditional Dene games. Mr. Justice Patrick Mahoney rules that the Baker Lake area is subject to the Aboriginal Rights of the Inuit living there, thereby establishing Aboriginal Rights in the Canadian legal system for the first time. Fort Good Hope replaces its Band and Settlement Councils with a unified Dene Council. Aklavik takes similar action in 1980, and more communities follow. First Nations citizens arrive in London, England in an attempt to halt the repatriation of the Canadian Constitution. John Munro, Minister of Indian Affairs agreed to reinstate funding to develop a land settlement position for Dene and Metis of the Mackenzie Valley. Esso Resources Canada and Interprovincial Pipeline Ltd. apply to the federal government for permission to expand the oil field at Norman Wells and to build an 866-km pipeline through Denendeh to Zama, Alberta. Fort Resolution residents oppose Shell’s plan to do seismic work in the Little Buffalo River area which they use for hunting and trapping. Thirty Dene travel to Ottawa to lobby against the Norman Wells Project. The Dene Nation Newsletter (later known as the Native Communications Society of the Western NWT) begins publication out of the Denendeh National Office. Members of the Legislative Assembly of the NWT recommend that the NWT be divided, subject to a plebiscite. The International “Russell Tribunal on the Rights of the Indians of the North and Latin America” finds Canada guilty of crimes against its Indian peoples under international law. The Federal Cabinet approves the Norman Wells pipeline project with a two-year delay. The Dene Nation and Metis Association release a discussion paper entitled “Public Government for the People of the North”. Almost half of the Dene Bands boycott the Treaty ceremonies. The Dene oppose an Alberta government plan to divert the waters of the Peace, Athabasca and Slave Rivers to flow south rather than north into the NWT. The United Nations Human Rights Committee find Canada and the Indian Act in violation of International law (Lovelace case). The plebiscite on division indicates that the people of the NWT want the NWT divided into two political jurisdictions, one in the east and one in the west. The Western Constitutional Forum and the Nunavut Constitutional Forum are established to come to clear positions on boundaries between east and west, and constitutional development. The Denendeh Development Corporation is incorporated in Ottawa, and then in the NWT in 1983. The Dene play a major role at the First Ministers Conference in Ottawa, established to define Aboriginal Rights in Canada. The Dene Nation, Metis Association and Esso Resources form Shehtah Drilling to take part in the Norman Wells expansion project. Georges Erasmus becomes Vice-Chief, Northern Region for the Assembly of First Nations. Despite the continued opposition of the Dene and many other Canadians, the first Cruise missile test takes place along the Deh Cho Valley. The Assembly of First Nations decides that women and men of Aboriginal descent should be treated equally under the Indian Act and Canadian Constitution. The Inuvialuit of the Mackenzie Delta reach a final agreement with the government of Canada. The Liard Highway connecting the Alaska Highway and the Mackenzie Highway is opened. Indigenous Survival International is formed to overcome the threat imposed by the anti-harvest movement. Pope John Paul II’s visit to Fort Simpson to meet with Native people from across Canada had to be canceled due to poor weather conditions. Dene Chiefs reaffirm Denendeh as the name for the Western NWT and call for more community discussion of the Denendeh government proposal. The Denendeh Development Corporation (DDC) opens its own office in Yellowknife. The Chiefs of Denendeh boycott the official opening ceremonies of the Norman Wells Project. Instead, they meet in Fort Simpson to repeat their concerns about the project. Bill C-31 is now law so that women who lost their status and their Band membership through marriage to a non-native can now have their status and Band membership restored. Georges Erasmus is elected National Chief of the Assembly of First Nations at the AFN’s Third Annual Assembly in Vancouver. Harry Allen, a former Chairman of the Council of Yukon Indians, is appointed by the Yukon and NWT Chiefs to serve as Northern Vice-Chief of the Assembly of First Nations. The federal government refuses to sign a formal agreement outlining benefits for northerners on the construction of the north Warning System. A U.S. cruise missile test ends with its crash on to the Beaufort Sea ice north of Herschel Island. The Dene Nation organizes the Dene Cultural Institute. Twenty-one staff members are laid off at Dene Nation because of federal funding cutbacks, including all community development field workers and the staff of the Communications and Interpreter departments, Lands and Resources department and Community Development Program. The Dene Nation releases “Dene Gondie”, a precedent-setting study on the socio-economic effects of the Norman Wells oil field expansion and pipeline project on the Dene residents and communities of the Mackenzie Valley. Dene Nation President Stephen Kakfwi, with the support of the Metis Association, demands a full public review on planned United States low-level military training flights in the NWT. A task force is created to prepare for the visit of His Holiness Pope John Paul II to Fort Simpson. Later in the year, the date is set: Septem-ber 20. The visit takes place in perfect weather and is a spiritual highlight for Dene and Metis people of the North. The Bessie Silcox Scholarships were first awarded to Dene and Metis students. The Dene Nation demands public hearings through the Environmental Assessment and Review Process on the low-level military bomber flights in the East Arm of Great Slave Lake. In February, the Assembly of First Nations hosts the Aboriginal Language Policy Conference in Ottawa, to develop a national strategy to Save native languages for future generations. The federal government appeals an NWT Supreme Court decision which gave former government leader Nick Sibbeston the right to challenge the constitutionality of the Meech Lake Accord. The NWT Court of Appeal rejects Sibbeston’s challenge. Federal and Dene/Metis negotiators reach an Agreement-In-Principle on land claims. The proposed AIP is discussed at the Dene National Assembly July 4-11 on the Hay River Dene Reserve and the Metis Association Assembly July 6-8 in Hay River. After concessions are made by the federal government, Dene/Metis leaders agree to sign the AIP in Rae in September. In November, Ethel Blondin is elected Member of Parliament for the Western Arctic, becoming the first Native woman to be elected to the House of Commons. The Dogrib Division Board of Education is proclaimed in May at a feast in Rae Lakes. The six-member board controls funding for schools in the five Dogrib communities. The Dogrib Tribal Council asked for the board in 1984. The Denendeh Land Use Planning Commission is appointed in June by the federal and territorial governments with the Dene/Metis naming Jonas Neyelle, Jim Villeneuve, Joe Migwi, and Jim Schaefer. The commission plans how land and water will be used in the Dene/Metis settlement areas. Neptune Resources and the Dogrib Tribal Council sign a deal guarante-eing Dogrib participation in the mine. It is the first pact of its kind between a mining firm and an NWT Dene community. Low-level flights are approved by the federal government over the objections of the Lutsel K’e Band, South Slave regional council, Dene Nation, and other groups. Dan Norris, a Metis from Inuvik is appointed as the Commissioner of the NWT, in September. The GNWT establishes an Aboriginal Rights court program to provide financial assistance to the Dene Nation for court challenges to the low-level flights over the South Slave region. The Vital Abel Boarding Home opens in Ndilo (Rainbow Valley) for the Dene/Metis of the Western Arctic. The federal government cuts funding of the Native Communications Society and Native Press. Dene languages become official languages of the NWT. “When the World Was New: Stories of the Sahtu Dene”, a book by Elder George Blondin, is published. The Dene/Metis leadership and federal representatives initial the comprehensive land claims agreement on April 9, 1990. The Supreme Court of Canada says unextinguished Aboriginal Rights are protected from unjustifiable federal laws and regulations. The Supreme Court of Canada rules that government cannot wipe out or reduce Aboriginal Rights without the consent of the Native people involved. Native leaders across Canada support Manitoba MLA Elijah Harper’s successful attempts to stall debate on the Meech Lake Accord in provincial legislature and thus effectively kill the Accord. The Dene National Assembly supports the Kahnesatake Mohawk of Oka in their struggle to retain their traditional territory. At the Joint Dene/Metis Assembly, the Mackenzie Delta delegates vote against a resolution to have Aboriginal and Treaty Rights affirmed in the land claims agreement, Sahtu delegates abstained on the motion. After the vote the Delta delegates left the Assembly. The Delta Region seeks its own regional land claim. On November 7, the Dene are informed that the federal government will no longer negotiate with them as a nation of people, and funding is promptly cut, retroactive to October 1. The Dene Nation is granted intervener status at the Supreme Court of Canada on the appeal of the Oldman River Dam case. The land freeze in the North Slave region is lifted. Former NWT Commissioner John Parker is appointed as an advisor to resolve a land claims boundary dispute between the TFN (Tungavik Federation of Nunavut) and the Dene Nation. In July, Denendeh National Office moves location from Northway Building to the Discovery Inn. $22,500 garnisheed from Fort Smith Band account and released to the town of Fort Smith for tax purposes. Dene Nation again proposes–as in December and January–that the substantial differences between the Dene Nation and the Government of Canada on the issue of extinguishment be submitted for “arbitration” by the NWT Minister for Justice in the form of a reference to the Supreme Court of the NWT. The August 1991 Dene National Assembly (Bell Rock) changes structure of Dene National Executive to include five Regional Vice-Chiefs. The Canadian Human Rights Commission publicly reaffirms support for the Dene by calling on the federal government to change its comprehensive claims policy on extinguishment of Aboriginal Rights. Territorial-wide plebiscite on division held in April, with a slim majority voting “yes”. Break down of the votes shows a majority in the west were opposed. Chiefs Leadership Meeting in Fort Simpson, June, voted to reject the federal government’s offer to re-open comprehensive land claims negotiations on condition the Dene give up their veto on provincehood status for NWT. Dene National Assembly, Wrigley, in July, unanimously voted to accept Tadoule Lake Dene as part of the membership of the Dene Nation. The Liberal Party Leader Jean Chretien rejects the federal government’s “Extinguishment Clause” requirement necessary for Aboriginal Land Claims, and announces his parties intention to abolish this requirement. In December, an agreement was signed between the federal government and GNWT to begin passage of Bill C-103, transferring land titles authority to the GNWT without Dene consent. In January 1993 a Dene Nation Review Committee was established to determine the future of the Dene Nation. The committee traveled to many of the communities in Denendeh to discuss a new direction for the Dene Nation and to make recommendations for amendments to the Dene Nation Constitution & By-Laws. Their final report was tabled during the 23rd Dene National Assembly. In July the GNWT Payroll Tax is imposed on the Dene. The Dene National Office and many Bands and Tribal Councils refuse to register and pay the controversial tax. Sub-Bands of Kakisa Lake, Colville Lake and West Channel become full Band status. On August 13th, during the first Annual Deh Cho Assembly in Kakisa Lake, the Deh Cho Declaration was adopted. A Group of Treaty #11 Dene from the Sahtu community of Fort Norman, sign a petition opposing the Sahtu Claim and announcing their support for the Dene Nation. The petition is presented to the Minister of Indian Affairs, Pauline Browes. The Ingraham Trail Development Areas Firearm Regulations (No Shooting Corridor) is approved in October, by the government of the NWT without the consent of the Yellowknives Dene. In January, Chiefs of the Deh Cho and Treaty #11 regions withdraw their participation and support for the GNWT Constitutional Development Steering Committee (CDSC) which was established to create a constitution for a new western territory. In March, the Deh Cho Chiefs meet with the Minister of Indian Affairs for the first time in four years. At that meeting they present their Self-Government Paper. The Begade Shotagotine inform DIAND Regional Director General of the formation of their new Band. The Begade Shotagotine are former beneficiaries of the Sahtu Claim. The 24th Dene National Assembly was held in Lutsel K’e. At this meeting the Deh Cho Grand Chief Gerald Antoine presented to the Dene Nation, the first payment towards their portion of an accumulated deficit to July 1993 of approximately $394,000.00. Each region had been invoiced in the amount of $68,504.00. Queen Elizabeth II visits the NWT. During a presentation with the Queen, Dene Chiefs remind Her Majesty of their “Peace and Friendship Treaties” with the Crown and advise her of the inadequate treatment of First Nations in Canada by the government of Canada. Bill Erasmus, Dene National Chief along with other Treaty #8 representatives met with federal Justice Minister Allan Rock. The meeting was to discuss Justice Issues, primarily the infringement on Treaty and Aboriginal Rights and proposed legislation on Gun Control (Bill C-68). Charges were laid against Archie Sangris and Elder Benoit Noel for unlawful hunting in a “No Shooting Corridor” along the Ingraham Trail. The Ingraham Trail is one of the many traditional hunting and trapping areas for the Yellowknives Dene. Dene Leaders are the first group in all of Canada to meet with Justice Hamilton while on his fact finding tour. The Minister of DIAND, Ron Irwin appointed Justice Hamilton as a fact finder for Alternatives to Extinguishment pursuant with the liberal governments “Red Book” commitments. January, the Dene Nation hosts the first Aboriginal Summit in Yellowknife to bring together all Aboriginal Representatives across the Western NWT to discuss a possible common front on the Constitutional Development Conference held in Yellowknife. Treaty #8 Chiefs announce their intention to observe the conference and not act as full participants. Deh Cho Chiefs agree that they will participate to inform and educate others on the Deh Cho territory and the Deh Cho proposal. The Dene Nation is served with a summons to appear in Justice of the Peace Court to face charges of failing to respond to a request to register under the Payroll Tax Act. Marks the 25th anniversary of the date of incorporation of the Indian Brotherhood of the NWT. The organization is now known as the Dene Nation. Dene Nation participated in the Environmental Review Process for BHP. Native organizations received less than 50% of the Intervener Funding from BHP, Dene Nation received no monies. Papua New Guinea delegates Alex Maun, clan leader and his lawyer Nick Styant-Brown were brought to Yellowknife for the BHP Public Hearings to comment on BHP’s mining in their home states. “We want to make sure that what BHP did to us in Papua New Guinea, does not happen to the Dene” says Alex Maun. Dene Environmental Gathering delegates agreed that Dene Science and Western Science methods must be incorporated together. The 25th Dene National Assembly was held in Deh Gah Got’ie (Ft. Providence). At this meeting, the Yellowknives Dene present a cheque for $5,000.00, to begin paying for their portion of the accumulated deficit to July 1993. First Nation’s rallied during Calgary Stampede grounds against cuts to First Nations Health Benefits. Community of Lutsel K’e had the grand opening of the Za’h Lockhart Memorial hall. Harvesters lobby in Brussels to inform European Officials on First Nations in Canada and the effect of a fur ban. March, Dene Nation facilitated a meeting of First Nations Peoples not recently represented on the Arctic Council. This will allow us to have a voice in international activities. Royal Commission on Aboriginal Peoples report released. This was a major research project which lasted five years and cost the federal government $5 million dollars. NWT Dene Chiefs Gathering in Yellowknife. Reuniting to begin discussing common issues. A “National Day of Action” is held across Canada, to lobby the federal government on not responding to the Royal Commission on Aboriginal Peoples Final Report. In Yellowknife, Dene Leaders attend press conferences and participated in events to promote awareness. During the Deh Cho Fifth Annual Assembly delegates resolved to implement a Moratorium over mining, oil and gas, forestry and other resource development. Companies operating within traditional lands of Deh Cho First Nations and are expected to acquire a First Nations resolution prior to land use or water use licence permitting. NWT Treaty #8 Tribal Council renamed Akaitcho Territory Tribal Council at their Annual Assembly in Dettah. First Nations across Canada celebrated the Supreme Court ruling in favor of First Nations rights the landmark decision Delgamuukw v. British Columbia. The Delgamuukw Supreme Court judgement offers an unprecedented opportunity for First Nations. For the first time, at a truly national and constitutional level, there has been an explicit recognition of the reality of Aboriginal title existing within the Canadian legal system. Jane Stewart, Minister of Indian Affairs issues a formal apology to First Nation Residential School Survivors and announces a $350 Million Healing Fund to begin the process of healing for those First Nation survivors. The minister of DIAND also releases “An Agenda for Action” and “Gathering Strength” documents. The two documents are the federal government’s response to recommendations made in the Royal Commission on Aboriginal Peoples Report of 1996. The leaders of Akaitcho Territory decided to join Deh Cho’s declaration that there will be a moratorium on any new development in their territory. Deh Cho Leaders Meet with Miguel Alfonso Martinez, United Nations Special Rapporteur on Indigenous Treaties, at the Hay River Dene Reserve. Dene made presentations on the treaty making process in Denendeh. The Dene Nation Supports the Inclusion of Treaties #8 and #11 In the United Nations Report on Indigenous Treaties. A three day Treaty Rights meeting concluded on February 11, 1998 at the Hay River Dene Reserve. Dr. Miguel Alfonso-Martinez was present to hear first hand the oral understanding of Treaties #8 and #11 from elders, community members and leaders of Akaitcho and Deh Cho Territories. Dene Nation questions Multilateral Agreement on Investment (MAI). National Chief Bill Erasmus stated “We are concerned that the MAI may affect our existing Treaty & Aboriginal Rights. We are calling on Canada to make clear to us the intent of the MAI and the participation of Canada in this agreement. We want the public to be informed and to participate in this process.” Erasmus further stated “The Dene are at various tables negotiating their future relationship with Canada, including the economic independence of their communities, and want to be assured that the MAI will not adversely affect the outcome of their discussions”. September, the Dene Nation hosts the third annual Elder/Scientist Retreat at the Blachford Lake Lodge. The focus of this years gathering focused on the participation of Dene Youth. The First Assembly of First Nations National Treaty Conference is held in Yellowknife, NT at the Explorer Hotel. Representatives from Across Canada met to discuss common Treaty issues and to review the recently released Draft Report of Dr. Miguel Alfonso Martinez, United Nations Special Rapporteur on International Treaties. Dene Leaders met in Yellowknife in an Economic Gathering hosted by the Denendeh Development Corporation. The Assembly of First Nations (AFN) and Canada host an AFN/Canada Joint Think Tank on Partnership. Top federal bureaucratic representatives and the AFN Executive sit together for the two day workshop where solutions to the trust relationship between First Nations and Canada are discussed. The “Gathering Strength” and “Agenda for Action” initiatives are further addressed. Harvesters from across Denendeh gather in Hay River to meet with Fur Institute of Canada on the Implementation of International Humane Trapping Standards. Dene National Chief Bill Erasmus sent a letter to the delegates in attendance to suggest a Denendeh Harvesters Committee be established. Some of the many recommendations from that meeting included; a) Trappers should tour the auction houses, then they can see what it is that the buyers want and how they want the furs. b) Northern fur should be separated from the fur from the south. Market it as a special collection of NWT fur. c) Try to get trapping recognized as a trade so that if someone is injured or there was a death then there would be some compensation. d) Pursue compensation packages to cover land loss due to environmental alterations. In Yellowknife some non-Dene called the “Friends of Democracy” organized themselves to get more representation in the NWT Legislature. They claimed that they are under-represented. This challenge of the Government of the Northwest Territories was brought before the NWT Supreme Court. The court ruled in favour of the “Friends of Democracy”. The judge ruled that they should have more representation in the legislature based on population. The major problem the Dene find with the decision is that it strongly reflects individual rights (section 3) in the Canadian Charter of Rights and Freedoms and not collective rights (section 25 & 35). When the Canadian Constitution Act 1982 was designed, the two sections were meant to be read together to complement each other rather than have individual rights of Canadians override First Nation citizens and governments. Dene Leaders gather at the Yellowknife Ski-Club. During this meeting, all of the Chiefs of Denendeh agree to work together towards a government to government to government arrangement between First Nations, federal and territorial levels of governments. A new Territory is created in Canada. The Inuit of the Eastern Northwest Territories achieve the government of Nunavut. The Supreme Court of Canada, in R. v. Gladue, sent a loud message to the lower courts not to rely so heavily on jail terms when dealing with Aboriginal offenders. It says judges must respect a new section of the Criminal Code that requires more emphasis on alternatives, such as community healing and victim/offender reconciliation, which are a traditional part of aboriginal culture. Finally, it appears this court is acknowledging what the Dene have always known to be important in the healing nature of traditional ways. Dene Nation is pleased with the Court’s recent decision to drop all hunting charges involving Denesuline First Nation members residing south of the 60th parallel. The Denesuline from Saskatchewan were charged with federal and territorial wildlife offences stemming from a traditional hunt North of 60, in 1998. Lawyers for the Denesuline First Nation members had indicated to the court that their defence would involve Treaty and Aboriginal rights. Dene Leadership Meeting is held at the Explorer Hotel. The GNWT Minister of Finance and Premier of the NWT, along with other Ministers and government representatives from both the GNWT and the Department of Indian Affairs & Northern Development Canada provide Chiefs with detailed financial information on the existing bureaucracies. The exercise was as a result of the recent commitment to enter a discussion on an Intergovernmental Relationship between the government of Canada, the administration of the GNWT and First Nation governing bodies. The Dene Nation assists in raising funds and coordinating the inaugural meeting for the “Aboriginal Sport Circle”. The first Board of Directors is elected and the Aboriginal Sport Circle begins functioning as an independent body. “Declaration of Kinship and Cooperation among the Indigenous Peoples and Nations of North America through the Assembly of First Nations and the National Congress of American Indians. We, the people knowing that the Creator placed us here on Mother Earth as sovereign nations and seeking to live in peace, freedom and prosperity with all humanity in accordance with our own traditional laws are united in our sacred relationship with the land, air, water and resources of our ancestral territories. We are bound by common origin and history, aspiration and experience, and we are brothers and sisters, leaders and warriors of our nations. We have all experienced outside encroachment upon our traditional homelands and we have striven to co-exist with other peoples and cultures in peace. Others’ hands have drawn boundaries between the Canada and the United States. These arbitrary lines have not severed, and never will, the ties of kinship among our peoples. Protecting and promoting the right of our citizens to move freely across the border of Canada and the United States while retaining full recognition of their status as members of indigenous nations. Our national organizations are authorized and encouraged to identify from time to time specific matters on which to focus their collective efforts toward the advancement of this declaration. The means of cooperation shall involve contacts between the national organizations at various levels, including leaders, officials or staff. Each of our national organizations has the authority to establish and receive diplomatic missions to foster understanding and cooperation. Our national organizations may choose to enter into specific bilateral agreements in accordance with our respective constitutions. The national organizations may also seek to strengthen the relationship among our peoples by facilitating exchanges among the representatives of our constituent peoples, groups and associations, and individual citizens. We are resolved at this the first ever joint assembly of our national organizations that we shall convene again on many occasions and that the spirit of understanding and fellowship among our peoples that we here experienced shall grow ever stronger as we take our full and rightful place in the community of all nations. Let it be resolved that member nations from the Assembly of First Nations and the National Congress Of American Indian, having met in joint assembly in Vancouver, British Columbia, affirm the foregoing, in honor of our ancestors and for the sake of future generations, as a declaration of international indigenous understanding, among nations and organizations. On behalf of the Assembly of First Nations and the National Congress of American Indians, in unity, solidarity, mutual respect and friendship, we the undersigned attest that this declaration represents the collective sentiment of those convened in Vancouver, British Columbia, Canada on Friday, July 23, 1999. Nick Sibbeston is appointed to the Canadian Senate. Mr. Sibbeston is the first descendent of the Dene to be appointed in the Canadian Senate. The affidavit of Dene National Chief Bill Erasmus regarding the federal court case that sought an order of prohibition against the making of legislative amendments to the Migratory Birds Convention Act regulations was sworn and submitted to the Attorney General of Canada, Department of Justice. The affidavit was allowed to be submitted as evidence. The Mill closes at the Giant Mine, shutting down the roaster and ending the production of Arsenic Trioxide. The Dene Leadership met in the Explorer Hotel. Internal discussion items led to the decision to revise and draft Constitution & By-Laws Amendments for presentation to the 30th Dene National Assembly. Water Board Hearings are held for the proposed Diavik project, the second potential diamond mine in Canada. The Dene Nation makes a presentation to the NWT Water Board, outlining their concerns and recommendations. The Yellowknives Dene, Lutsel K’e Dene and Dogrib Dene also made presentations at this hearing. Elders and Youth from these communities addressed the concerns around protecting Lac de Gras, the site of the proposed project. After 51 years and more than 7 million ounces the last brick of gold was poured at the Giant Mine. Later the same month Miramar Con Ltd. purchases the Giant Mine Property. Stephen Harper is elected Prime Minister of Canada. We the Aboriginal Peoples of the Northwest Territories agree in principle to build a business partnership to maximize ownership and benefits of a Mackenzie Valley pipeline.